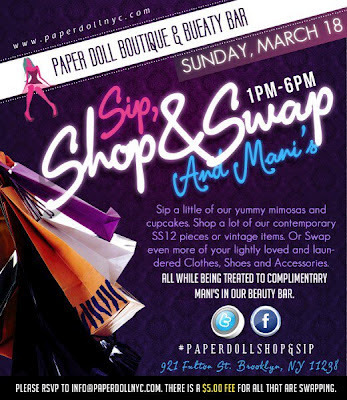 Paper Doll Boutique & Beauty Bar invites you to Sip, Shop and Swap… and Mani’s!! Sip a little of yummy mimosas and cupcakes. Shop a lot of contemporary SS12 pieces or vintage items. Or Swap even more of your lightly loved and laundered Clothes, Shoes and Accessories. All while being treated to complimentary Mani’s in the Beauty Bar. Please RSVP to info@paperdollnyc.com. There is a $5.00 fee for all that are swapping.